All market speculators share the same goal, which is to enjoy consistent low risk profits. To accomplish this goal, you must be able to identify market turning points and market moves as this is the only way to attain low risk and high reward entries into market (trading) positions. Whether you are a short term day trader or a longer term investor, nothing changes. Identifying key market turning points is the only way to attain the ideal risk/reward opportunity. Leading Extended Learning Track (XLT) sessions for so long, I have come across many people in the program. Occasionally, I receive an email from a member that is not satisfied with their results and desires better returns. Most of the time they are not necessarily losing money, but they are not making money or not making enough money, and desire more. One of my first questions to them has to do with strategy. I ask them, “Do you have a plan and are you following that plan?” Half the time the answer is no so we dive into creating a proper plan and the importance of following that plan. The other half says they do have a plan and follow it much of the time. For this group my questions turn to the details of their plan; the strategy, where I look to see if their rules are proper or not. Sometimes there is a rule or two that is incorrect and the student doesn’t know this so we correct it. In my many years of experience, I have found that most of the time there is one specific and crucial rule that is missing from people’s plans more than any other, and that is the focus of this piece. Before we discuss this rule and its importance, let’s first turn our attention back to market turning points. Price movement in any and all markets is a function of an ongoing demand and supply equation. Market prices turn at price levels where this simple and straightforward equation is out of balance. Therefore, price in any market turns at price levels where demand and supply are out of balance which means the strongest turns in price occur at price levels where demand and supply are most out of balance. So, the question for us is this: what exactly does this picture look like on a price chart? When I ask students this question, they quickly describe the picture of demand that I have shown in articles for years, which is a “Drop – Base – Rally” (DBR) or “Rally – Base – Rally” (RBR). They then describe supply which is “Rally – Base – Drop” (RBD) or “Drop – Base – Drop” (DBD). These are the pictures that clearly show price levels where demand and supply are out of balance which is what we as market speculators are looking for. Next, students go right into their rules for entries, targets and stops. This is where I stop them as they are ignoring perhaps the most crucial rule that should be included in their trading plan. Drop – Base – Rally may be the picture of a price level where demand exceeds supply, a demand level. But, what EXACTLY is a demand level for you and your trading plan? I find that most people don’t quantify this with numbers. Quantifying exactly what “demand” (or supply) is to you and your plan is a key component to a trading plan that gives you an edge over other trading plans that don’t. We have a number of “Odds Enhancers” at Online Trading Academy which are key to quantifying and identifying real demand and supply but those are beyond the scope of this article. To explain this further, we will however dive into the details of one of the most important Odds Enhancers. Let’s look at a recent trading example from our OTA Supply and Demand Grid. The chart above is Crude Oil. The supply level is a DBD coming out of a RBD. Just because it represents the pattern/picture we are looking for does not at all mean we have a low risk/high reward trading opportunity. One of the most important questions that comes next is whether there is a significant “profit zone” associated with this supply level or not; this is the key Odds Enhancer most overlook. The presence of a significant profit zone is key for two reasons. First, it helps quantify the risk and reward. Second, the larger the profit margin, the higher the probability. This is because a big profit zone means price is far from equilibrium and out at price levels where the demand and supply imbalances are largest. 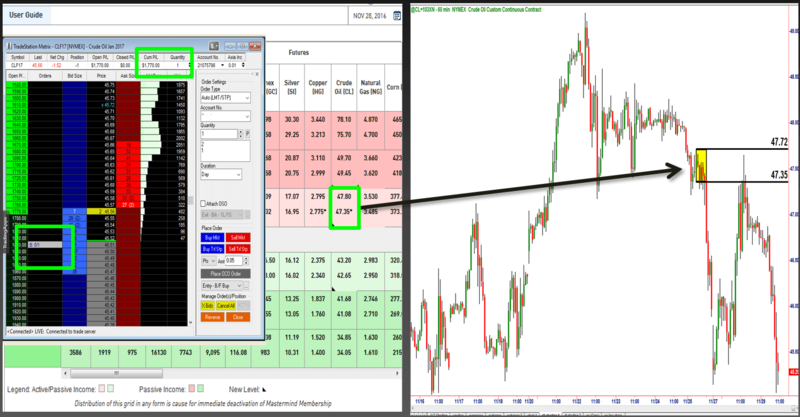 The distance between the two black lines is the distance from our entry point to our protective stop loss price to manage risk. We sell short at the bottom black supply line and place our stop just above the upper black demand line. This helps measure our risk. The distance between our supply and target (prior low in this case) represents our potential profit zone or initial profit zone. Notice the strong rally that takes price up to supply for our short entry. That rally “opens up” a profit zone for us as we are willing sellers when price revisits that supply level which it did, offering us our short entry. Rule: A level only becomes a level if the initial rally from the level is at least three times the level itself (1:3 Risk/Reward). Meaning, if the distance from entry to stop is two points in a market, the initial price move from that level has to be at least six points or it does not qualify as a level at all. I will ignore any levels that don’t meet this minimum requirement. While we require a 1:3 as a minimum requirement for the supply level to actually meet the definition of a supply level, it may be different for you. You may require 1:4, or whatever. Personally, I am looking for even more than that. In this example, the chart was offering us more than our minimum requirement. What this suggested was the probability of price hitting our profit target was very likely. This does not mean that the target has to be at the bottom. It simply means that this opportunity is offering you more than what you are looking for and this will increase winning percentage if that is an important factor for you. Price ended up reaching the target for a low risk and high reward trade. One of the most important factors for this successful trade was the length and speed of the initial decline away from the supply level combined with how price rallied back to the level, and this is a rule many market speculators fail to consider. Many people talk about supply and demand when trading and writing trading plans. Few actually define what supply and demand levels really are. This is another step in building the edge required to get paid from your competition instead of paying them. Buy Low , Sell High , a Novel Concept for Trading? Are you an efficient Trader? What is a Central Bank and What Can it Do for Me? 'The Most Wonderful Time of the Year'… for Real Estate Investors! !